This tab has a notes field on the left hand side, this can be used for personal or business reasons and can be typed straight in or pasted from other applications. 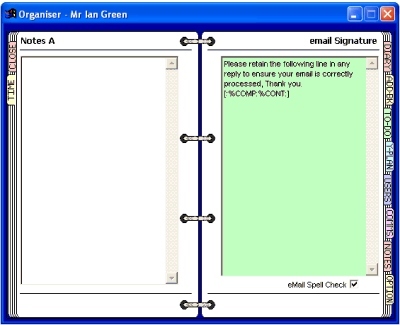 The right hand side contains a field to enter your email signature, this can be cut and pasted from your Outlook signature. The information entered here will be added at the end of emails sent from the communication window. The text is automatically saved when the organiser is closed or a new tab is selected. If this box is ticked, all emails will be automatically spell-checked before leaving the system. To disable this function, untick the box.